(left-right) PVM Director of Advancement Chad Rohlfs, former ECFVG Program student Diego Florez, Dr. Tony Dillon (PU DVM '89), PVM Clinical Professor Emeritus Mark Hilton (PU DVM '83) and Dr. Debbie White (PU DVM '94) pause for a photo at the PVM Alumni Reception during the Western Veterinary Conference. Dr. Hilton is WVC president-elect and Dr. White is a member of the WVC Board of Directors. 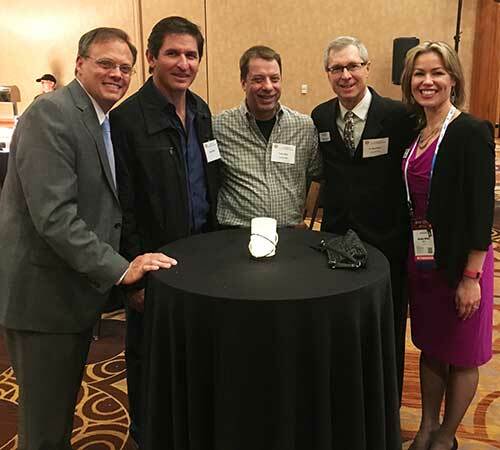 About 50 Purdue Veterinary Medicine alumni and friends turned-out for the annual Purdue Alumni Reception in Las Vegas, Nev., Monday evening, March 6, during the annual Western Veterinary Conference (WVC). They renewed acquaintances, visited with PVM faculty who were in attendance, and heard an update on the College's and Ever True campaign goals from Dean Willie Reed. In some cases, members of a given class, like the Class of 2016, would realize they had enough classmates present for a mini reunion. Attendees included alumni from the College's third graduating class, the Class of 1965, as well as current students. The event was held at Mandalay Bay, the main convention hotel for the conference.